Rosa multiflora is a perennial shrub that forms dense, impenetrable thickets of vegetation . It colonises roadsides, old fields, pastures, prairies, savannas, open woodlands and forest edges and may also invade dense forests where disturbance provides canopy gaps. It reproduces by seed and by forming new plants that root from the tips of arching canes that contact the ground. Rosa multiflora is tolerant of a wide range of soil and environmental conditions and is thought to be limited by intolerance to extreme cold temperatures. Many species of birds and mammals feed on the hips of Rosa multiflora; dispersing the seeds widely. 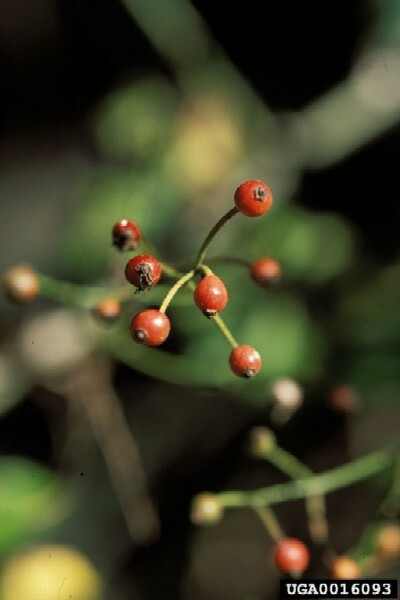 R. multiflora can colonise gaps in late-successional forests, even though these forests are thought to be relatively resistant to invasion by non-native species. It invades pasture areas, degrades forage quality, reduces grazing area and agricultural productivity and can cause severe eye and skin irritation in cattle. There are many strategies available to manage and control R. multiflora involving physical, chemical and biological means. Munger (2002) states that R. multiflora \"bushes grow to a height of 1.8 to 3 metres and occasionally 4.6m. Stems (canes) are few to many, originating from the base, much branched, and erect and arching to more or less trailing or sprawling. Canes grow to 4m long and are armed with stout recurved prickles. Leaves are alternate, pinnately compound, and 8 to 11cm long with 5 to 11 (usually 7 or 9) leaflets 2.5 to 4cm long. Flowers are 1.3 to 1.9cm across and number 25 to 100 or more in long or pointed panicles. Fruits (hips) are globular to ovoid, 0.64cm or less in diameter. Seeds are angular achenes.\"
Bergmann and Swearingen (2001) state that R. multiflora, \"Was introduced to the East Coast of the USA from Japan in 1866 as rootstock for ornamental roses. Beginning in the 1930s, the U.S. Soil Conservation Service promoted it for use in erosion control and as 'living fences' to confine livestock. State conservation departments soon discovered value in R. multiflora as wildlife cover for pheasant, bobwhite quail, and cottontail rabbit and as food for songbirds and encouraged its use by distributing rooted cuttings to landowners free of charge. 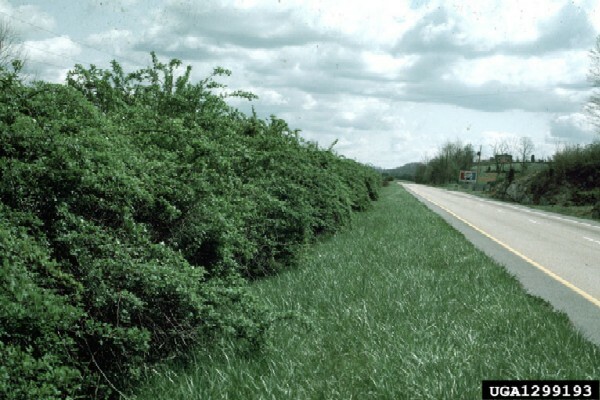 More recently, R. multiflora has been planted in highway median strips to serve as crash barriers and to reduce automobile headlight glare. Its tenacious and unstoppable growth habit was eventually recognized as a problem on pastures and unplowed lands, where it disrupted cattle grazing. For these reasons, R. multiflora is classified as a noxious weed in several states.\"
The Wisconsin Department of Natural Resources (2003) states that R. multiflora, \"Blooms in May or June. Individual plants may produce up to 500,000 seeds per year. The majority of seedlings emerge near the parent plant from which the seeds fell. In addition, many species of birds and mammals feed on the hips, dispersing the seeds widely. The canes are also capable of rooting when in contact with soil.\"
The origins of R. multiflora in North America stem from its use as a rootstock species for ornamental roses and as a fencerow plant.\" Munger (2002) states that in North America, R. multiflora \"hips are consumed by many species of birds including grouse (Phasianinae), ring-necked pheasants ( Phasianus colchicus) and wild turkeys ( Meleagris gallopavo), and are particularly sought after by cedar waxwings ( Bombycilla cedrorum) and American robins ( Turdus migratorius). Leaves and hips are consumed by chipmunks, white-tailed deer, opossums, coyotes, black bears, beavers, snowshoe hares, skunks, and mice. Leaves, twigs, bark and fruit are eaten by cottontail rabbits, particularly during fall and winter. 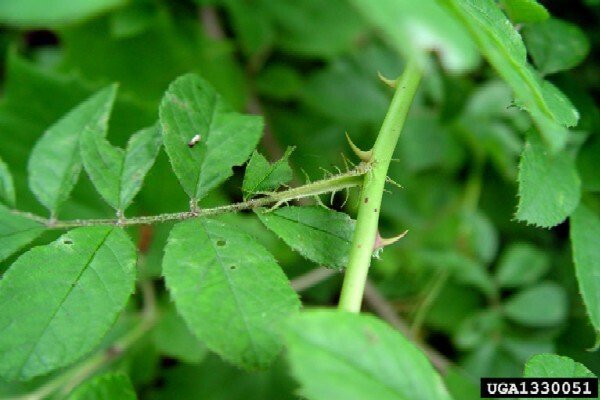 The hips of Rosa spp. are especially important as winter wildlife food, when other high-nutrition foods are unavailable. 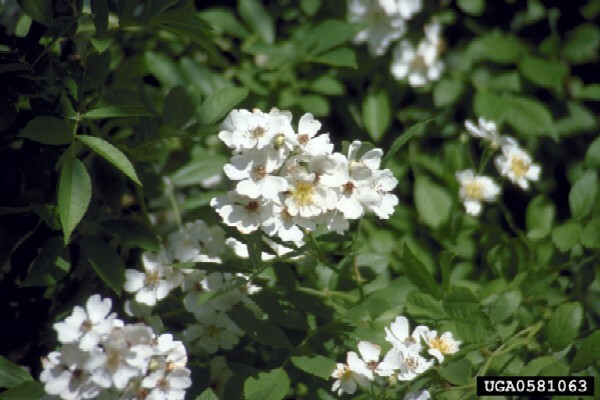 R. multiflora is used for cover during all times of year by cottontail rabbits, white-tailed deer, pheasants, and mice. It is a preferred nesting site species for gray catbirds. Southwestern willow flycatchers, a federally listed endangered species, were observed nesting in R. multiflora in New Mexico.\"
Munger (2002) states that R. multiflora \"...frequently colonizes roadsides, old fields, pastures, prairies, savannas, open woodlands, and forest edges, and may also invade dense forests where disturbance provides canopy gaps. It is most productive in sunny areas with well-drained soils.\" R. multiflora \"...is tolerant of a wide range of soil and environmental conditions, but is not found in standing water or in extremely dry areas. Its northern distribution is thought to be limited by intolerance to extreme cold temperatures, but specific information is lacking.\" (Munger, 2002). Bergmann and Swearingen (2001) state that R. multiflora, \"Reproduces by seed and by forming new plants that root from the tips of arching canes that contact the ground. Fruits are readily sought after by birds, which are the primary dispersers of its seed. It has been estimated that an average R. multiflora plant may produce a million seeds per year, which may remain viable in the soil for up to twenty years. Germination of R. multiflora seeds is enhanced by passing through the digestive tract of birds.\"
Beginning in the 1930s, the U.S. Soil Conservation Service promoted it for use in erosion control and as 'living fences' to confine livestock (Bergmann and Swearingen, 2001). 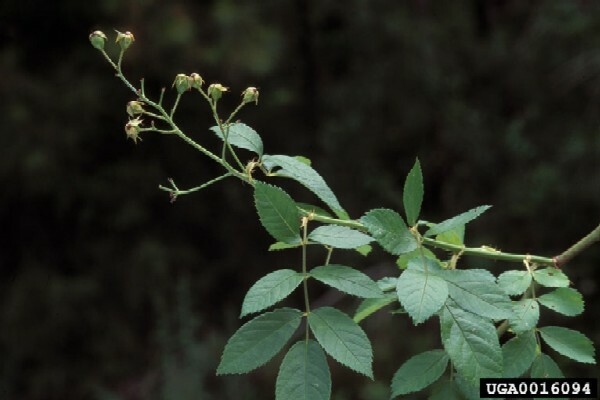 Recommended citation: Global Invasive Species Database (2019) Species profile: Rosa multiflora. Downloaded from http://www.iucngisd.org/gisd/species.php?sc=215 on 22-04-2019. Munger (2002) states that, \"Because seeds are bird dispersed, R. multiflora can colonize gaps in late-successional forests, even though these forests are thought to be relatively resistant to invasion by nonnative species. However, without extensive or recurrent disturbance, R. multiflora is probably not a serious long-term invasion threat in mature forests. It will likely be shaded out by surrounding trees and shade-tolerant shrubs. R. multiflora is clearly a serious pest plant in many areas of North America. It invades pasture areas, degrades forage quality, reduces grazing area and agricultural productivity and can cause severe eye and skin irritation in cattle. R. multiflora can spread rapidly, severely restricting access to pasture and recreational areas with 'impenetrable thickets'. Its characteristic dense growth of foliage and stems inhibits growth of competing native plants.\"
Physical: One eradication method that is believed to be quite effective is routine prescribed burning. It may be preferred over introducing rose rosette disease, which will affect native and other ornamental roses as well as multiflora rose (Szafoni, R.E. 1991). \r\nChemical: Where appropriate, herbicides may be an effective means of controlling R. multiflora, especially when used in combination with other methods. Foliar spraying is effective throughout the growing season as long as leaves are fully formed. Dormant season application is also effective, and further reduces nontarget mortality. Basal bark treatment, applied to the lower 46 to 6cm of the stem and onto the root crown, is a recommended chemical control method for dormant season application. Follow-up monitoring and retreatment during the subsequent growing season may be required to ensure effectiveness. \r\nBiological: R. multiflora is highly susceptible to rose rosette disease (RRD), which is transmitted by the eriophyid mite Phyllocoptes fructiphilus. Based on field experiments, Amrine and Stasny project that RRD has the potential to eliminate over 90 % of the R. multiflora in areas of dense stands. RRD can also be transmitted to healthy R. multiflora plants by grafting buds from symptomatic plants. Introducing a few infected grafts into relatively dense stands can potentially lead to widespread infection within a R. multiflora population. \r\nAnother potential biocontrol agent is the rose seed chalcid (Megastigmus aculeatus), a Japanese wasp that has become established in the eastern United States. The adult wasps oviposit into developing R. multiflora ovules, where larvae later consume seeds. \r\nDefoliation experiments indicate periodic browsing of foliage by livestock may effectively control R. multiflora. Domestic sheep and goats will feed on leaves, new buds, and new shoots. Cattle are much less effective in controlling R. multiflora. \r\nIntegrated management: Munger (2002) states that, \"Well-established populations are unlikely to be eradicated with a single treatment, regardless of method. Because seeds remain viable in soil for many years, and because new seeds may be continually imported by birds and other animals, effective management requires post-treatment monitoring and spot treatment are needed for an indeterminate time to prevent reinvasion.\" The author goes on to report that, \"R. multiflora can be controlled by periodic mowing or cutting of individual plants. Painting or spraying cut stems with herbicides expedites control by killing root systems and preventing resprouting. Another approach is to follow an initial mowing with foliar applied herbicide once plants have resprouted. In high quality natural areas, cutting individual stems may be preferable to mowing, since repeated mowing might damage sensitive native plants.\"
\r\nFor large infestations, mowing may be preferable due to efficiency. Periodic annual mowing can also prevent R. multiflora seedlings from becoming established. Removal of entire plants may be feasible in high quality natural areas when populations are sparse enough. Removal of the entire root system is required to ensure no regrowth from suckering. Informations on Rosa multiflora has been recorded for the following locations. Click on the name for additional informations. Bergmann, C., and J. M., Swearingen. 2001. 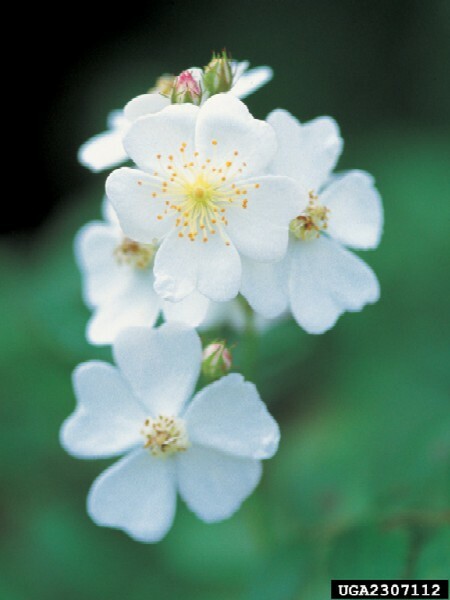 Multiflora Rose: Rosa multiflora Thunb.. Plant Conservation Alliance, Alien Plant Working Group. Available from: http://www.nps.gov/plants/alien/fact/romu1.htm [Accessed 22 October 2003]. Munger, G. T. 2002. Rosa multiflora. U.S. Department of Agriculture, Forest Service, Rocky Mountain Research Station, Fire Sciences Laboratory. Fire Effects Information System, [Online Database]. Available from: http://www.fs.fed.us/database/feis/plants/shrub/rosmul/all.html [Accessed 22 October 2003]. Szafoni, R.E. 1991. 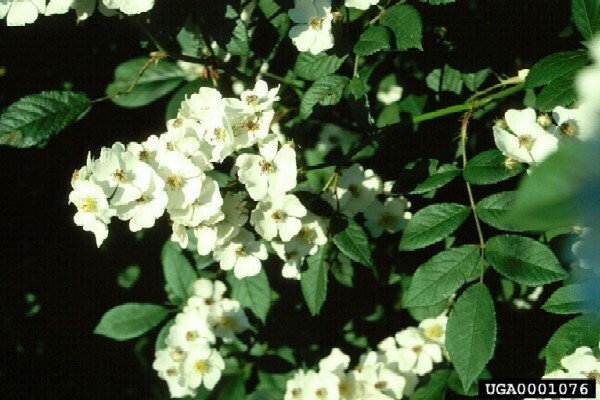 Vegetation management guideline: Multiflora rose. Wisconsin Department of Natural Resources. 2003. Multiflora Rose: Rosa multiflora. Non-Native Invasive Species: Plants. USDA-GRIN (Germplasm Resources Information Network). 2003. Rosa multiflora. National Genetic Resources Program [Online Database] National Germplasm Resources Laboratory, Beltsville, Maryland. Available from: http://www.ars-grin.gov/cgi-bin/npgs/html/taxon.pl?32108 [Accessed 22 October 2003]. Summary: Available from: http://plants.usda.gov/java/profile?symbol=ROMU [Accessed 22 October 2005].